Sick dogs typically spend most of their day sleeping and resting. If your pup vomits once or twice, it's usually not a big deal. If he can't stop or other symptoms appear, his body is doing its best to tell you he's sick and needs medical attention. The faster your vet diagnoses his ailment, the faster your dog can resume chasing his tail and sleeping without a worry. Dogs are the garbage disposals of the pet world, and they'll gladly scarf down anything they can get their mouth on, including garbage itself. Dog food won't usually cause vomiting -- although in the case of a severe allergic reaction it might -- but human food commonly will. Raw meat can cause food poisoning, and just a bit of chocolate can cause seizures, diarrhea and excessive thirst and vomiting. As a general rule, it's best to avoid table food altogether. Insecticides that make quick work of annoying pests can also cause severe problems for your pup if he licks up excess residue. Antifreeze, even a tiny amount, can cause severe vomiting and ultimately death if your dog doesn't receive help soon after ingesting it. Don't think just because insecticides, antifreeze and other chemicals taste bad that your dog will avoid them. He's probably curious enough to check out whether the taste is as bad as the smell. Several diseases cause vomiting, but they include a great deal of other symptoms as well, such as loss of balance, extreme thirst, seizures and skin discoloration. 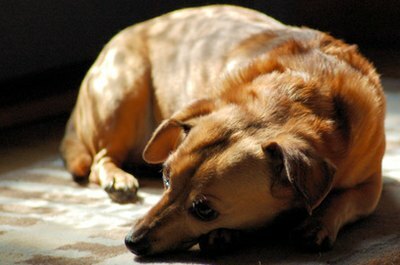 Addison's disease, for example, causes dogs to vomit, suffer from fatigue and occasionally experience seizures. An inner ear disease causes your pup to lose his balance for seemingly no reason and, at times, vomit. Diseases rarely cause a dog to only throw up. You'll almost always see other symptoms. Only your vet can properly diagnose a disease. Gastric dilatation and volvulus, also known as GDV, is present when your pup's stomach expands and wraps around itself. The condition causes your pup to vomit, but he will produce nothing aside from the possibility of a small amount of stomach fluid or saliva. Your dog will have a difficult time breathing, and his stomach will appear visibly expanded. 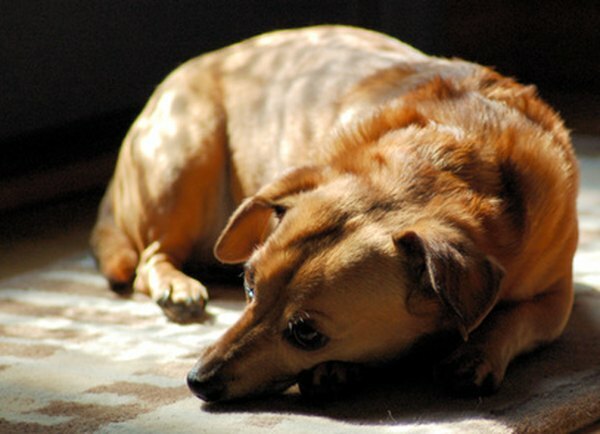 If you notice your dog displaying these symptoms, rush him to the vet immediately. This is a deadly condition if not remedied as soon as possible. Viruses most often affect puppies that haven't yet had important shots to ward off against distemper, parvovirus and other viruses. Most viruses cause vomiting and diarrhea without warning, resulting in dehydration. If your dog hasn't yet had his shots, keep him away from public places, such as dog parks, and visit your vet immediately. Cancer and pain medication largely cause stomach ulcers, which in turn cause vomiting, often after the dog eats. Dogs who vomit due to the presence of ulcers may have blood in their vomit, explains Washington State University College of Veterinary Medicine. If your canine buddy experiences other symptoms aside from vomiting, experiences severe and constant vomiting or continues vomiting for more than a day, pay a visit to your vet as soon as possible. The more information about your dog's vomiting you can relay to your vet, the better. Washington State University College of Veterinary Medicine suggests collecting a sample of the vomit in a plastic bag to bring in so your vet can analyze it.